← Coffee Talk With Jesus Book Release & Giveaways! Tomorrow we will celebrate Thanksgiving, a time of year that causes one to pause and reflect on all that is good in their life. So often during this time of year I can tend to allow anxiety to overrun me. It’s hard to remain balanced when life has me running here and there, with hardly time to breathe most days (although isn’t breathing automatic?). I can allow the pressure and stress of the season to weigh heavy on my heart, and I will often forget to stop and give thanks to the One who is worthy of all praise and thanksgiving, at all times. I want my heart to overflow with thanksgiving. I want to have a grateful heart and to truly know what it is like to “give thanks in all things and in all circumstances.” There are so many moments of beauty that pass me by each day because I am so focused on my circumstances or on the days ahead. I forget to pause, to breathe Him in, and to offer up thanksgiving, because truly, I have so much to be thankful for, and really, He is worthy, no matter what. A thankful heart chooses to look beyond the piles of dirty laundry to the beauty of clothing that I get to wear. A thankful heart chooses to look beyond the imperfections of a child to the beauty of a budding, independent personality. A thankful heart chooses to look beyond the inattentiveness of a husband to the beauty of a man who works hard to provide for his family. A thankful heart chooses to look beyond my lack to the beauty of all that I have been given. A thankful heart chooses to look beyond myself to the beauty that is Christ Jesus. How about you my friend? What kind of beauty is overflowing from your heart today? 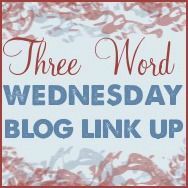 Linking up with my dear friend Beth for Three Word Wednesday. Join me? Love three word Wednesday – what a beautiful list – thank you! I hope you had a wonderful Thanksgiving, Barbie. My heart is truly overflowing with thankfulness today. It was so hard to say good-bye to my husband but as I sit here waiting for my next flight, instead of being sad I’m filled with joy over the time He gave us together and knowing I’m blessed with so many wonderful friends. And oh, I’m reading this amazing book as I travel that is blessing me so. Wow girl!!! So love your book! Beth, I’ve been thinking about you this weekend. So thankful for this time the Lord has allowed you both. I am thankful my little book is ministering to your heart! Love you! Hoping you and yours had a wonderful Thanksgiving and are readying your hearts for the celebration of our Savior’s birth. Happy weekend! Thanks for stopping by Lea! You remind me, friend, of the choices I always have, to choose Him, to see Him, to rejoice in Him, to celebrate in all He’s given and continues to give. Thank you! I pray you lean back into His arms today, rejoicing in the light of this day! Happy Thanksgiving, beautiful one! Jennifer, praying you and your family had a beautiful Thanksgiving! I am thankful for His grace today. He gives grace for hard days. He give me more of Him. He never runs out of grace! Blessings! I am just the opposite than you as far as busyness is concerned because of being chronically ill. At times I feel as if I cannot rest flat on my back for another day. But then I ask our Lord to help me to keep my eyes fixed on the things we cannot see for only they are eternal. That fills my heart with so much gratitude. Oh Mia, I cannot imagine. Your faith in God despite your circumstances is truly beautiful. Hugs! Have a blessed Thanksgiving with your family. Thank you Child of God! Barbie, so very true. Thankfulness needs to be intentional & then it becomes a habit. May thankfulness fill our hearts in the coming days & bless those around us. Happy Thanksgiving! Blessed by you Joanne! Praying you had a beautiful Thanksgiving!